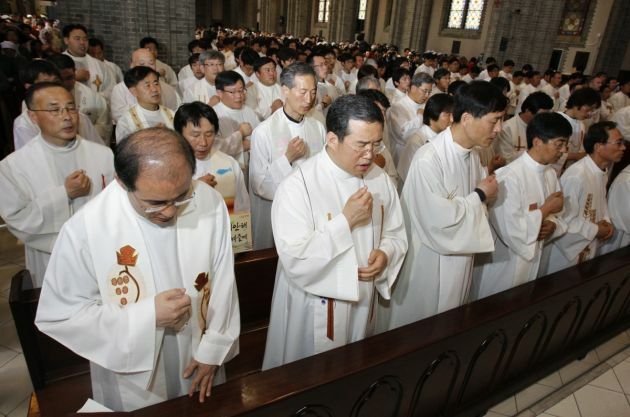 (Photo: REUTERS / Jo Yong-Hak)Catholic priests pray during a mass prayer demanding the Four River Restoration Project to be stopped, at Myeongdong Cathedral in Seoul May 10, 2010. Thousands of Catholics, including about 300 priests, denounced a massive river restoration project at the centre of South Korean President Lee Myung-bak's green growth strategy that, as conservation group's report say, will harm globally threatened bird species and destroy critical habitat. An association of North Korean Catholics has declined an invitation to send attend a mass officiated by Pope Francis in Seoul during his scheduled visit to South Korea next week. In a letter sent to the Archdiocese of Seoul, the State-run (North) Korean Catholic Association cited South Korean's refusal to cancel a scheduled military drill with U.S. forces as the main reason for their rejection. "Under these circumstances, coming to Seoul would be an agonizing step," the KCA letter said as quoted by ucannews.org. The Pope will preside over a special reconciliation mass on the last day of his August 14-18 visit to South Korea. The gathering is seeking to help mend bridges between the two Koreas which are still technically in a state of war since 1953. But Francis' service coincides with an annual military drill, which the North branded as a rehearsal for a nuclear war. The archdiocese said it had sent invitations to Pyongyang as early as May so that it could send a delegation to attend the mass. The request apparently fell on deaf ears. "We interpret this as meaning the North finds it difficult to accept the invitation," an official at the South Korean Catholic Bishops' Conference said. The constitution of North Korea allows freedom of religion, but the guarantee is not absolute, according to asianews.it. The Catholic Church there is controlled by the government through the KCA, putting tight restrictions in the practice of the faith. Little is known whether about priests or nuns in the reclusive state, and the KCA does not have any direct links to the Vatican. The KCA claims to have a following of 3,000 people, but some analysts have said the figure is dubious and put the actual figure to 800. They are believed to be elderly, as they are among the last people to be baptized as Catholics when the Korean War began in 1950. The Pope's mass will be held in Myeongdong Cathedral in Seoul, centering on the theme of peace and reconciliation.